Disney•Pixar proudly presents the hilarious story of how two mismatched monsters met and became lifelong friends in a movie screaming with laughter and oozing with heart. 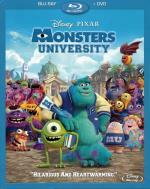 Ever since college-bound Mike Wazowski (Billy Crystal) was a little monster, he has dreamed of becoming a Scarer—and he knows better than anyone that the best Scarers come from Monsters University (MU). But during his first semester at MU, Mike's plans are derailed when he crosses paths with hotshot James P. Sullivan, "Sulley" (John Goodman), a natural-born Scarer. The pair's out-of-control competitive spirit gets them both kicked out of the University's elite Scare Program. With their dreams temporarily dashed, they realize they will have to work together, along with an odd bunch of misfit monsters, if they ever hope to make things right. This was an entertaining, enjoyable movie. It's bright and colorful, with beautifully realized animation and a lot of really fun character designs. There are a lot of funny moments, and a good heart, even if you know all the tropes from every movie about college you've ever seen. Yet they still manage to do something original with the ending. It has a couple of good messages as well, one about not judging people and the second that your dreams might not come true the way you envision them. There is a minor continuity error with Monsters Inc., but nothing that removes any of the pleasure of watching this film. It's a good time, and I could recommend it for anyone. I enjoyed it when I saw it in the theater.